Many people agree on the fact that history is one of the most remarkable human consciousnesses. Etymologically the word History (in Greek knopia - historia, meaning "inquiry, knowledge acquired by investigation" in Ge' ez Tarik meaning "a series of narration") is the study of the human past. It is a field of research and investigation which uses a narrative to examine and analyze the sequence of events. History often focuses on events and developments that occur in particular blocks of time and particular geographical locations that can form the basis of historical study. Apart from this Historians especially in modem time usually take different questions such as When was the source, written or unwritten, produced (date)? Where was it produced (localization)", By whom was it produced (authorship)? From what pre-existing material was it produced (analysis)? In what original form was it produced (integrity)? And what is the evidential value of its contents (credibility)? The content of church history is both social and spiritual. As a social matter it gives the history of the Christian society in this world. On the other hand it is considered as the work of the Almighty God in the life of His believers. Therefore, Church History brings us in touch with our spiritual ancestry. In any society the faithful should know the history of his/her nation, to be the best member of the community. Similarly, the understanding of our church history enabled us to be more dedicated church followers. On the other hand the history of the church helps portray the fullness of the development of our faith in Christ both institutionally and individually. As a general norm of history to know the past serves as a basis for understanding the present and forecast the future. And the genuine analysis of the past will put us to stop repeating mistakes. Apart from its importance to all believers, church history has a very particular necessity for church leaders, theological students, researchers and intellectual thinkers. This is because it is a veritable storehouse of information on successful religious leadership, theological discussions, and development of religious thought. Ethiopian Orthodox Tewahedo Church history in particular has a very interesting significance in understanding the socio- cultural and political history of the country. That is why many people agree on the fact that "to study the history of the Church in Ethiopia is to study the history of the country, and the vice versa". After long time of preparation part one of the Ethiopian Orthodox Tewahedo Church history was published in 2008. Now I have presented part two and part three in one volume. I believe that this book will partially address the demand of the non- Amharic speakers, who want to know the history of the EOTC in English. PART II deals with the medieval history of the EOTC which is from the reign of Emperor Caleb until the end of Zagwe Dynasty and PART III is ranged from the. Classical (Golden) Age to the Present. In conclusion I would like to thank Memhir Daniel SeifeMichael for editing the whole draft by giving his time generously. I wish to express my deep gratitude to Dr. Haddis Yeshanew, Memhir Alemayehu Alemneh, Dr. Ralph Lee and Mlr Chere Abeba for their friendship. I also deeply appreciate Wit Maereg Tefera for typing the draft. 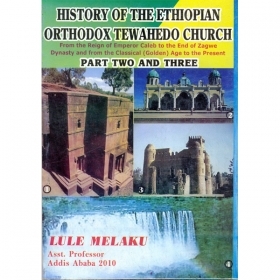 Part one of this work, which was published in 2008, had offer substantial knowledge about the History of the Ethiopian Orthodox Tewahedo Church. This current publication is a direct Continuation which gives a more in depth Understanding about the topic at hand. The book presents how the Ethiopian Church has preserved Apostolic teachings and archaic Tradition of Christian faith throughout history. I generally believe that it can be utilized in four different contexts. First, it is preciously valuable for both foreigners and members of the Ethiopian Orthodox Tewahedo Church throughout the world. Second, it is highly recommended for Ethiopians and their children who are living in the Diaspora and who cannot read or write their national language. Thirdly, it is very instrumental to the great number of tourists and visitors flooding every year to know more about Ethiopian and the Ethiopian Church. Lastly, it is for different groups of individuals such as teachers, researchers, tourist guides and the like. I warmly congratulate Professor Lule Melaku for his successful completion. The history of the Church is he History of the kingdom of God on Earth. As many people agree, I believe the understanding the history of the Ethiopian Orthodox Tewahedo Church's History is the main key for understanding the History of Ethiopia. Professor Lule's work uniquely joins this fact shows fabulously how we can learn from our own past. $inee We are part of the whole in time and space, the Church History is the story of how we became who we now are. As a result, the Church has offered us a chance to be always connected with our true ancestries.Prindpally, writing Church history is not a one generation duty as long as the Church exists there is the History of the Church.And its our duty to record every detail of our time genuinely and carefully.Professorand Lule has fulfilled this obligation in a more sensible and rational way. In his fifty years of Academic Service, Professor has nurtured his student with numerous works. I would say this is one of the most precious gifts. I invite all to par-take this wonderful work.